Eleftherios Kyriakou Venizelos (full name Elefthérios Kyriákou Venizélos, Greek: Ελευθέριος Κυριάκου Βενιζέλος, pronounced [elefˈθerios cirˈʝaku veniˈzelos]; 23 August 1864 – 18 March 1936) was an eminent Greek leader of the Greek national liberation movement and a charismatic statesman of the early 20th century, remembered for his contribution in the expansion of Greece and promotion of liberal-democratic policies. As leader of the Liberal Party, he was elected several times, in total eight, as Prime Minister of Greece, serving from 1910 to 1920 and from 1928 to 1933. Venizelos had such profound influence on the internal and external affairs of Greece that he is credited with being "the maker of modern Greece", and is still widely known as the "Ethnarch". His first entry into the international scene was with his significant role in the autonomy of the Cretan State and later in the union of Crete with Greece. Soon, he was invited to Greece to resolve the political deadlock and became the country's Prime Minister. Not only did he initiate constitutional and economic reforms that set the basis for the modernization of Greek society, but also reorganized both army and navy in preparation of future conflicts. Before the Balkan Wars of 1912–1913, Venizelos' catalytic role helped gain Greece entrance to the Balkan League, an alliance of the Balkan states against the Ottoman Empire. Through his diplomatic acumen, Greece doubled its area and population with the liberation of Macedonia, Epirus, and most of the Aegean islands. In World War I (1914–1918), he brought Greece on the side of the Allies, further expanding the Greek borders. However, his pro-Allied foreign policy brought him into direct conflict with Constantine I of Greece, causing the National Schism. The Schism polarized the population between the royalists and Venizelists and the struggle for power between the two groups affected the political and social life of Greece for decades. Following the Allied victory, Venizelos secured new territorial gains, especially in Anatolia, coming close to realizing the Megali Idea. Despite his achievements, he was defeated in the 1920 General Election, which contributed to the eventual Greek defeat in the Greco-Turkish War (1919–22). Venizelos, in self-imposed exile, represented Greece in the negotiations that led to the signing of the Treaty of Lausanne, and the agreement of a mutual exchange of populations between Greece and Turkey. In his subsequent periods in office, Venizelos succeeded in restoring normal relations with Greece's neighbors and expanded his constitutional and economical reforms. In 1935 he resurfaced from retirement to support a military coup. Its failure severely weakened the Second Hellenic Republic. In the 18th century, the ancestors of Venizelos, named Cravvatas, lived in Mystras, in southern Peloponnese. During the Ottoman raids in the peninsula in 1770, a member of the Cravvatas family, Venizelos Cravvatas, the youngest of several brothers, managed to escape to Crete where he established himself. His sons discarded their patronymic and called themselves Venizelos. The family was of Laconic, Maniot, and Cretan origin. Eleftherios was born in Mournies, near Chania (formerly known as Canea) in then-Ottoman Crete to Kyriakos Venizelos [la], a Cretan merchant and revolutionary, and Styliani Ploumidaki. When the Cretan revolution of 1866 broke out, Venizelos' family fled to the island of Syros, due to the participation of his father in the revolution. They were not allowed to return to Crete, and stayed in Syros until 1872, when Abdülaziz granted an amnesty. He spent his final year of secondary education at a school in Ermoupolis in Syros from which he received his Certificate in 1880. In 1881 he enrolled at the University of Athens Law School and got his degree in Law with excellent grades. He returned to Crete in 1886 and worked as a lawyer in Chania. Throughout his life he maintained a passion for reading and was constantly improving his skills in English, Italian, German, and French. The situation in Crete during Venizelos' early years was fluid. The Ottoman empire was undermining the reforms, which were made under international pressure, while the Cretans desired to see the Sultan, Abdul Hamid II, abandon "the ungrateful infidels". Under these unstable conditions Venizelos entered into politics in the elections of 2 April 1889 as a member of the island's liberal party. As a deputy he was distinguished for his eloquence and his radical opinions. The numerous revolutions in Crete, during and after the Greek War of Independence (1821, 1833, 1841, 1858, 1866, 1878, 1889, 1895, 1897) were the result of the Cretans' desire for Enosis — Union with Greece. In the Cretan revolution of 1866, the two sides, under the pressure of the Great Powers, came to an agreement, which was finalized in the Pact of Chalepa. Later the Pact was included in the provisions of the Treaty of Berlin, which was supplementing previous concessions granted to the Cretans — e.g. the Organic Law Constitution (1868) designed by William James Stillman. In summary the Pact was granting a large degree of self-government to Greeks in Crete as a means of limiting their desire to rise up against their Ottoman overlords. However the Muslims of Crete, who identified with Ottoman Empire, were not satisfied with these reforms, as in their view the administration of the island was delivered to the hands of the Christian Greek population. In practice, the Ottoman Empire failed to enforce the provisions of the Pact, thus fueling the existing tensions between the two communities; instead, the Ottoman authorities attempted to maintain order by the dispatching of substantial military reinforcements during 1880–1896. Throughout that period, the Cretan Question was a major issue of friction in the relations of independent Greece with the Ottoman Empire. In January 1897 violence and disorder were escalating on the island, thus polarizing the population. Massacres against the Christian population took place in Chania and Rethimno. The Greek government, pressured by public opinion, intransigent political elements, extreme nationalist groups such as Ethniki Etaireia, and the reluctance of the Great Powers to intervene, decided to send warships and army personnel to defend the Cretan Greeks. The Great Powers had no option then but to proceed with the occupation of the island, but they were late. A Greek force of about 2,000 men had landed at Kolymbari on 3 February 1897, and its commanding officer, Colonel Timoleon Vassos declared that he was taking over the island "in the name of the King of the Hellenes" and that he was announcing the union of Crete with Greece. This led to an uprising that spread immediately throughout the island. The Great Powers decided to blockade Crete with their fleets and land their troops, thus stopping the Greek army from approaching Chania. In a meeting of the Executive Committee, Venizelos expressed his opinion that the island was not in essence autonomous, since militarily forces of the Great Powers were still present, and that the Great Powers were governing through their representative, the Prince. Venizelos suggested that once the Prince's service expired, then the Great Powers should be invited to the Committee, which, according to article 39 of the constitution (which was suppressed in the conference of Rome) would elect a new sovereign, thereby removing the need for the presence of the Great Powers. Once the Great Powers' troops left the island along with their representatives, then the union with Greece would be easier to achieve. This proposal was exploited by Venizelos' opponents, who accused him that he wanted Crete as an autonomous hegemony. Venizelos replied to the accusations by submitting once again his resignation, with the reasoning that for him it would be impossible henceforth to collaborate with the Committee's members; he assured the Commissioner however that he did not intend to join the opposition. Popular lithograph celebrating the coup's success. Greece steps triumphantly over the dead monster of the old-party system, cheered by the army and the people. Venizelos went to Athens and after consulting with the Military League and with representatives of the political world, he proposed a new government and Parliament's reformation. His proposals were considered by the King and the Greek politicians dangerous for the political establishment. However, King George I, fearing an escalation of the crisis, convened a council with political leaders, and recommended them to accept Venizelos' proposals. After many postponements the King agreed to assign Stephanos Dragoumis (Venizelos' indication) to form a new government that would lead the country to elections once the League was disbanded. In the elections of 8 August 1910, almost half the seats in the parliament were won by Independents, who were newcomers to the Greek political scene. Venizelos, despite doubts as to the validity of his Greek citizenship and without having campaigned in person, finished at the top at the electoral list in Attica. He was immediately recognized as the leader of the independents and thus he founded the political party, Komma Fileleftheron (Liberal Party). Soon after his election he decided to call for new elections in hope of winning an absolute majority. The old parties boycotted the new election in protest and on 11 December 1910, Venizelos' party won 307 seats out of 362, with most of the elected citizens being new in the political scene. Venizelos formed a government and started to reorganize the economic, political, and national affairs of the country. On 20 May 1911, a revision of the Constitution was completed, which focused on strengthening individual freedoms, introducing measures to facilitate the legislative work of the Parliament, establishing of obligatory elementary education, the legal right for compulsory expropriation, ensuring permanent appointment for civil servants, the right to invite foreign personnel to undertake the reorganization of the administration and the armed forces, the re-establishment of the State Council and the simplification of the procedures for the reform of the Constitution. The aim of the reform program was to consolidate public security and rule of law as well as to develop and increase the wealth-producing potential of the country. In this context, the long planned "eighth" Ministry, the Ministry of National Economy, assumed a leading role. This Ministry, from the time of its creation at the beginning of 1911, was headed by Emmanuel Benakis, a wealthy Greek merchant from Egypt and friend of Venizelos. Between 1911 and 1912 a number of laws aiming to initiate labor legislation in Greece were promulgated. Specific measures were enacted that prohibited child labor and night-shift work for women, that regulated the hours of the working week and the Sunday holiday, and allowed for labor organizations. Venizelos also took measures for the improvement of management, justice and security and for the settlement of the landless peasants of Thessaly. At the time there were diplomatic contacts with the Ottoman Empire to initiate reforms in Macedonia and in Thrace, which at the time were under the control of the Ottoman Empire, for improving the living conditions of the Christian populations. Failure of such reforms would leave as a single option to remove Ottoman Empire from the Balkans, an idea that most Balkan countries shared. This scenario appeared realistic to Venizelos, because Ottoman Empire was under a constitutional transition and its administrative mechanism was disorganized and weakened. There was also no fleet capable of transporting forces from Asia Minor to Europe, while in contrast the Greek fleet was dominating the Aegean Sea. Venizelos did not want to initiate any immediate major movements in the Balkans, until the Greek army and navy were reorganized (an effort that had begun from the last government of Georgios Theotokis) and the Greek economy was revitalized. In light of this, Venizelos proposed to Ottoman Empire to recognize the Cretans the right to send deputies to the Greek Parliament, as a solution for closing the Cretan Question. However, the Young Turks (feeling confident after the Greco-Turkish war in 1897) threatened that they would make a military walk to Athens, if the Greeks insisted on such claims. Venizelos, seeing no improvements after his approach with the Turks on the Cretan Question and at the same time not wanting to see Greece remain inactive as in the Russo-Turkish War in 1877 (where Greece's neutrality left the country out of the peace talks), he decided that the only way to settle the disputes with Ottoman Empire, was to join the other Balkan countries, Serbia, Bulgaria and Montenegro, in an alliance known as the Balkan League. Crown Prince Constantine was sent to represent Greece to a royal feast in Sofia, and in 1911 Bulgarian students were invited to Athens. These events had a positive impact and on 30 May 1912 Greece and the Kingdom of Bulgaria signed a treaty that ensured mutual support in case of a Turkish attack on either country. Negotiations with Serbia, which Venizelos had initiated to achieve a similar agreement, were concluded in early 1913, before that there were only oral agreements. Montenegro opened hostilities by declaring war on Turkey on 8 October 1912. On 17 October 1912, Greece along with her Balkan allies declared war on Turkey, thus joining the First Balkan War. On 1 October, in a regular session of the Parliament Venizelos announced the declaration of war to Turkey and accepting the Cretan deputies, thus closing the Cretan Question, with the declaration of the union of Crete with Greece. The Greek population received these developments very enthusiastically. The outbreak of the First Balkan war caused Venizelos a great deal of trouble in his relations with Crown Prince Constantine. Part of the problems can be attributed to the complexity of the official relations between the two men. Although Constantine was a Prince and the future King, he also held the title of army commander, thus remaining under the direct order of the Ministry of Military Affairs, and subsequently under Venizelos. But his father, King George, in accordance to the constitutional conditions of the time had been the undisputed leader of the country. Thus in practical terms Venizelos' authority over his commander of the army was diminished due to the obvious relation between the Crown Prince and the King. and tried to keep frequent communication with the key figure, the King, in order to prevent the Prince from marching north. Subsequently, although the Greek army won the Giannitsa battle situated 40 km west of Salonika, Constantine's hesitation in capturing the city after a week had passed, led into an open confrontation with Venizelos. Venizelos, having accurate information from the Greek embassy in Sofia about the movement of the Bulgarian army towards the city, sent a telegram to Constantine in a strict tone, holding him responsible for the possible loss of Thessaloniki. The tone in Venizelos' telegram and that in the answer from Constantine that followed to announce the final agreement with the Turks, is widely considered as the start of the conflict between the two men that would lead Greece into the National Schism during World War I. Finally on 26 October 1912, the Greek army entered Thessaloniki, shortly ahead of the Bulgarians. But soon a new reason of friction emerged due to Venizelos' concern about Constantine's acceptance of the Bulgarian request to enter the city. A small Bulgarian unit, which soon became a full division moved into the city and immediately started an attempt to establish a condominium in spite of initial assurances to the contrary, showing no intentions to leave. After Venizelos' protest Constantine asked him to take the responsibility (as a prime minister) by ordering him to force them out, but that was hardly an option since that would certainly lead to confrontation with the Bulgarians. To Venizelos' view, since Constantine allowed the Bulgarians to enter the city, he now passed the responsibility of a possible conflict with them to him, in an attempt to deny his initial fault. To Constantine, it was an attempt by Venizelos to get involved in clearly military issues. Most historians agree that Constantine failed to see the political dimensions of his decisions. As a consequence both incidents increased mutual misunderstanding, shortly before Constantine's accession to the throne. Once the campaign in Macedonia was completed, a large part of the Greek army under the Crown Prince was redeployed to Epirus, and in the Battle of Bizani the Ottoman positions were overcome and Ioannina taken on 22 February 1913. Meanwhile, the Greek navy rapidly occupied the Aegean islands still under Ottoman rule. After two victories, the Greek fleet established naval supremacy over the Aegean preventing the Turks from bringing reinforcements to the Balkans. On 20 November, Serbia, Montenegro and Bulgaria signed a truce treaty with Turkey. It followed a conference in London, in which Greece took part, although the Greek army still continued its operations in the Epirus front. The conference led to the Treaty of London between the Balkan countries and Turkey. Τhese two conferences gave the first indications of Venizelos' diplomatic efficiency and realism. During the negotiations and facing the dangers of Bulgarian maximalism, Venizelos succeeded in establishing close relations with the Serbs. A Serbian-Greek military protocol was signed on the 1 June 1913 ensuring mutual protection in case of a Bulgarian attack. Despite all this, the Bulgarians still wanted to become a hegemonic power in the Balkans and made excessive claims to this end, while Serbia asked for more territory than what was initially agreed with the Bulgarians. Serbia was asking for a revision of the original treaty, since it had already lost north Albania due to the Great Powers' decision to establish the state of Albania, in an area that had been recognized as a Serbian territory of expansion under the prewar Serbo-Bulgarian treaty. Bulgarians also laid claims on Thessaloniki and most of Macedonia. In the conference of London, Venizelos rebuffed these claims, citing the fact that it had been occupied by the Greek army, and that Bulgaria had denied any definite settlement of territorial claims during the pre-war discussions, as it had done with Serbia. The rupture between the allies, due to the Bulgarian claims, was inevitable, and Bulgaria found herself standing against Greece and Serbia. On 19 May 1913, a pact of alliance was signed in Thessaloniki between Greece and Serbia. On 19 June, the Second Balkan War began with a surprise Bulgarian assault against Serbian and Greek positions. Constantine, now King after his father's assassination in March, neutralized the Bulgarian forces in Thessaloniki and pushed the Bulgarian army further back with a series of hard-fought victories. Bulgaria was overwhelmed by the Greek and Serbian armies, while in the north Romania interfered against Bulgaria and the Romanian army was marching towards Sofia; Ottomans also took advantage of the situation and retook most of the territory taken by Bulgaria. The Bulgarians asked for truce. Venizelos went to Hadji-Beylik, where the Greek headquarters were, to confer with Constantine on the Greek territorial claims in the peace conference. Then he went to Bucharest, where a peace conference was assembled. On 28 June 1913 a peace treaty was signed with Greece, Montenegro, Serbia and Romania on one side and Bulgaria on the other. Thus, after two successful wars, Greece had doubled its territory by gaining most of Macedonia, Epirus, Crete and the rest of the Aegean Islands, although the status of the latter remained as yet undetermined and a cause of tension with the Ottomans. With the outbreak of World War I and the Austro-Hungarian invasion in Serbia, a major issue started regarding the participation or not of Greece and Bulgaria in the war. Greece had an active treaty with Serbia which was the treaty activated in the 1913 Bulgarian attack that caused the Second Balkan War. That treaty was envisaged in a purely Balkan context, and was thus invalid against Austria-Hungary, as was supported by Constantine and his advisors. The situation changed when the Allies, in an attempt to help Serbia, offered Bulgaria the Monastir–Ochrid area of Serbia and the Greek Eastern Macedonia (the Kavala and Drama areas) if she joined the Entente. Venizelos, having received assurances over Asia Minor if the Greeks participated in the alliance, agreed to cede the area to Bulgaria. On the other hand, Constantine favored the Central Powers and wanted Greece to remain neutral. He was influenced both by his belief in the military superiority of Germany and also by his German wife, Queen Sophia, and his pro-German court. He therefore strove to secure a neutrality, which would be favorable to Germany and Austria. In 1915, Winston Churchill (then First Lord of the Admiralty) suggested to Greece to take action in Dardanelles on behalf of the allies. Venizelos saw this as an opportunity to bring the country on the side of the Entente in the conflict. However the King and the Hellenic Army General Staff disagreed and Venizelos submitted his resignation on 21 February 1915. Venizelos' party won the elections and formed a new government. Even though Venizelos promised to remain neutral, after the elections of 1915, he said that Bulgaria's attack on Serbia, with which Greece had a treaty of alliance, obliged him to abandon that policy. A small scale mobilisation of the Greek army took place. The dispute between Venizelos and the King reached its height shortly after that and the King invoked a Greek constitutional provision that gave the monarch the right to dismiss a government unilaterally. Meanwhile, using the excuse of saving Serbia, in October 1915, the Entente disembarked an army in Thessaloniki,, after invitation by Venizelos. This action of Prime Minister Venizelos enraged Constantine. On 26 May 1916 the Fort Rupel (a significant military fort in Macedonia) was unconditionally surrendered by the royalist government to Germano-Bulgarian forces. This produced a deplorable impression. The Allies feared a possible secret alliance between the royalist government and Central Powers placing in grave danger of their armies in Macedonia. On the other hand, the surrender of Fort Rupel for Venizelos and his supporters meant the beginning of the destruction of Greek Macedonia. Despite German assurances that the integrity of the Kingdom of Greece would be respected they were unable to restrain the Bulgarian forces, which had started dislocating the Greek population, and by 4 September Kavala was occupied. On 16 August 1916, during a rally in Athens, and with the support of the allied army that had landed in Thessaloniki under the command of General Maurice Sarrail, Venizelos announced publicly his total disagreement with the Crown's policies. The effect of this was to further polarize the population between the royalists (also known as anti-Venezelists), who supported the crown, and Venizelists, who supported Venizelos. On 30 August 1916, Venizelist army officers organized a military coup in Thessaloniki, and proclaimed the "Provisional Government of National Defence". Venizelos along with Admiral Pavlos Kountouriotis and General Panagiotis Danglis agreed to form a provisional government and on 9 October they moved to Thessaloniki and assumed command of the National Defence to oversee the Greek participation in the allied war effort. The triumvirate, as the three men became known, had formed this government in direct conflict with the Athens political establishment. There they founded a separate "provisional state" including Northern Greece, Crete and the Aegean Islands, with the support of the Entente. Primarily, these areas comprised the "New Lands" won during the Balkan Wars, in which Venizelos enjoyed a broad support, while "Old Greece" was mostly pro-royalist. However, Venizelos declared "we are not against the King, but against the Bulgarians". He didn't want to abolish the monarchy and continued his efforts to persuade the King to join the Allies, blaming his "bad advisors" for his stance. The National Defence government started assembling an army for the Macedonian front and soon participated in operations against the Central Powers forces. In the following months after the creation of provisional government in Thessaloniki in late August, negotiations between the Allies and king intensified. The Allies wanted further demobilisation of the Greek army as a counterbalance of the unconditional surrender of Fort Rupel by the royalist government and military evacuation of Thessaly to insure the safety of their troops in Macedonia. On the other hand, the king wanted assurances that the Allies would not officially recognise Venizelos' provisional government or further support it, guarantees that Greece's integrity and neutrality would be respected, and a promise that any war material surrendered to the Allies would be returned after the war. The Franco-British use of Greece's territory in co-operation with the Venizelos government i[›] throughout 1916 was opposed in royalist circles and therefore increased Constantine's popularity, and caused much excitement and several anti-Allied demonstrations took place in Athens. Moreover, a growing movement had been developed in the army among lower officers, led by military officers Ioannis Metaxas and Sofoklis Dousmanis, determined to oppose disarmament and the surrender of any war materials to the Allies. The Allies' pressure on the government of Athens continued. On the next day, 24 November, du Fournet presented a new ultimatum ending on 1 December to the government of Athens demanding the immediate surrender of at least ten mountain batteries. The admiral made a last effort to persuade the king to accept France's demands. He advised the king that according to his orders he would land an Allied contingent, with aim to occupy certain positions in Athens until his demands were satisfied. In reply, the King claimed that he was pressed by the army and the people not to submit to disarmament, and refused to make any commitment. However, he promised that the Greek forces would receive orders not to fire against the Allied contingent. Despite the gravity of the situation both the royalist government and the Allies let the events take their own course. The royalist government decided to reject the admiral's demands on 29 November and armed resistance was organised. By 30 November military units and royalist militia (the epistratoi, "reservists") from surrounding areas have been recalled and gathered in and around Athens (in total over 20,000 men) and occupied strategic positions, with orders not to fire unless fired upon. On the other hand, the Allied authorities failed in their assessment of the prevailing temper. A diplomat characteristically insisted that the Greeks were bluffing, and in the face of force they would "bring the cannons on a plater"; a viewpoint that Du Fournet also shared. The Allies landed a small contingent in Athens on 1 December [O.S. 18 November] 1916. However, it met organized resistance and an armed confrontation took place for a day till a compromise was reached. After the evacuation of the Allied contingent from Athens the following day, a royalist mob raged though the city for three days targeting supporters of Venizelos. The incident became known as the Noemvriana in Greece, which was using the Old Style calendar at the time, and drove a deep wedge between the Venizelists and their political opponents, deepening what would become known as the National Schism. After the armed confrontation in Athens, on 2 December [O.S. 19 November] 1916, Britain and France officially recognised the government under Venizelos as the lawful government, effectively splitting Greece into two separate entities. On 7 December [O.S. 24 November] 1916, Venizelos' provisional government officially declared war on the Central Powers. In reply, a royal warrant for the arrest of Venizelos was issued and the Archbishop of Athens, under pressure by the royal house, anathematised him. The Allies unwilling to risk a new fiasco, but determined to solve the problem, established a naval blockade around southern Greece, which was still loyal to the king, and that caused extreme hardship to people in those areas. In June France and Great Britain decided to invoke their obligation as "protecting powers", who had promised to guarantee a constitutional form for Greece at the time the Kingdom was created, to demand the king's resignation. Constantine accepted and on the 15 June 1917 went to exile, leaving his son Alexander on the throne as demanded (whom the Allies considered as pro-Entente), instead of his elder son and crown prince, George. His departure was followed by the deportation of many prominent royalists, especially army officers such as Ioannis Metaxas, to exile in France and Italy. The course of events paved the way for Venizelos to return in Athens on 29 May 1917 and Greece, now unified, officially entered the war on the side of the Allies. Subsequently, the entire Greek army was mobilized (though tensions remained inside the army between supporters of the monarchy and supporters of Venizelos) and began to participate in military operations against the Central Powers army on the Macedonian front. 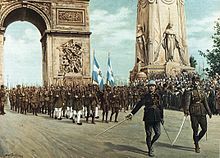 Painting depicting Greek military units in the World War I Victory Parade in Arc de Triomphe, Paris. July 1919. By the fall of 1918, the Greek army numbering 300,000 soldiers, was the largest single national component of the Allied army in the Macedonian front. The presence of the entire Greek army gave the critical mass that altered the balance between the opponents in the Macedonian front. Under the command of French General Franchet d'Espèrey, a combined Greek, Serbian, French and British force launched a major offensive against the Bulgarian and German army, starting on 14 September 1918. After the first heavy fighting (see Battle of Skra) the Bulgarians gave up their defensive positions and began retreating back towards their country. On 24 September the Bulgarian government asked for an armistice, which was signed five days later. The Allied army then pushed north and defeated the remaining German and Austrian forces that tried to halt the Allied offensive. By October 1918 the Allied armies had recaptured all of Serbia and were preparing to invade Hungary. The offensive was halted because the Hungarian leadership offered to surrender in November 1918 marking the dissolution of the Austro-Hungarian empire. The breaking of the Macedonian front was one of the important breakthroughs of the military stalemate and helped to bring an end to the War. Greece was granted a seat at the Paris Peace Conference under Venizelos. The assassination attempt by Greek royalists at the Gare de Lyon. Following the defeat of the Greek army by the Turks in 1922 and the subsequent armed insurrection led by Colonels Nikolaos Plastiras and Stylianos Gonatas, King Constantine was dethroned (and succeeded by his eldest son, George), and six royalist leaders were executed. Venizelos assumed the leadership of the Greek delegation that negotiated peace terms with the Turks. He signed the Treaty of Lausanne with Turkey on 24 July 1923. The effect of this was that more than a million Greeks (Christians) were expelled from Turkey, in exchange for the more than 500,000 Turks (Muslims) expelled from Greece, and Greece was forced to give up claims to eastern Thrace, Imbros and Tenedos to Turkey. This catastrophe marked the end of the Megali Idea. After a failed pro-royalist insurrection led by General Ioannis Metaxas forced King George II into exile, Venizelos returned to Greece and became prime minister once again. However, he left again in 1924 after quarreling with anti-monarchists. Venizelos with Kemal Atatürk in Ankara; October 27, 1930. Venizelos' greatest achievement in foreign policy during this period was the reconciliation with Turkey. Venizelos had expressed his will to improve the bilateral Greek–Turkish relations even before his electoral victory, in a speech in Thessaloniki (July 23, 1928). Eleven days after the formation of his government, he sent letters to both the prime minister and the minister of foreign affairs of Turkey (İsmet İnönü and Tevfik Rüştü respectively), declaring that Greece had no territorial aspirations to the detriment of their country. İnönü's response was positive and Italy was eager to help the two countries reach an agreement. Negotiations however stalled because of the complicated issue of the properties of the exchanged populations. Finally, the two sides reached an agreement on April 30, 1930; on October 25, Venizelos visited Turkey and signed a treaty of friendship. Venizelos even forwarded Atatürk's name for the 1934 Nobel Peace Prize, highlighting the mutual respect between the two leaders. The German Chancellor Hermann Müller described the Greek-Turkish rapprochement as the "greatest achievement seen in Europe since the end of the Great War". Nevertheless, Venizelos' initiative was criticized domestically not only by the opposition but also by members of his own party that represented the Greek refugees from Turkey. Venizelos was accused of making too many concessions on the issues of naval armaments and of the properties of the Greeks who were expelled from Turkey according to the Treaty of Lausanne. His domestic position was weakened, however, by the effects of the Great Depression in the early 1930s; and in the elections of 1932 he was defeated by the People's Party under Panagis Tsaldaris. The political climate became more tense and in 1933 Venizelos was the target of a second assassination attempt. The pro-royalist tendencies of the new government led to two Venizelist coup attempts by General Nikolaos Plastiras: one in 1933 and the other in 1935. The failure of the latter proved decisive for the future of the Second Hellenic Republic. After the coup's failure Venizelos left Greece once more, while in Greece trials and executions of prominent Venizelists were carried out and he himself was sentenced to death in absentia. The severely weakened Republic was abolished in another coup in October 1935 by General Georgios Kondylis and George II returned to the throne following a rigged referendum in November. One of the main contributions of Venizelos to Greek political life was the creation, in 1910, of the Liberal Party, which contrasted with the Greek parties of that period. Until the early twentieth century, the Greek parties were inspired by the protecting powers (French or English Party for example) or clustered around a political personality, such as Charilaos Trikoupis. The Liberal Party was based around the ideas of Venizelos (and the military coup of Goudi), but it survived its creator. In addition, the birth of a leading party would coincide with the birth of an opposing party. The opposing party was reflected around the personality of the king, but that survived the various abolitions of the monarchy. Venizelism, from its inception, is essentially a liberal Republican movement, which opposes anti-venizelist monarchist and conservative ideologies. These two competed for power throughout the inter-war period. Its main ideas, adapted from its creator, were: opposition to the monarchy; the defence of the Megali Idea; formation of alliances with western democratic countries, in particular the United Kingdom and France against Germany during the First and Second World Wars, and later with the United States against the Soviet Union during the Cold War; and finally a protectionist economic policy. Themistoklis Sofoulis was, from the 1920s, the successor of Venizelos as leader of the Liberal Party, which survived policy failures, exile and ultimately death of the historical founder. In 1950, the son of Venizelos, Sophoklis Venizelos, succeeded as head of the Liberal Party at a time when an agreement was formed with the populists (name of the royalist party) against the communists during the civil war. The Center Union (Enosis Kendrou), founded in 1961 by Georgios Papandreou, became the ideological descendant of the Liberal Party. The Center Union eventually fade in the late 1970s and was replaced by a party further to the left, Panhellenic Socialist Movement of Andreas Papandreou. In December 1891 Venizelos married Maria Katelouzou, daughter of Eleftherios Katelouzos. The newlyweds lived in the upper floor of the Chalepa house, while Venizelos' mother and his brother and sisters lived on the ground floor. There, they enjoyed the happy moments of their marriage and also had the birth of their two children, Kyriakos [el] in 1892 and Sofoklis in 1894. Their married life was short and marked by misfortune. Maria died of post-puerperal fever in November 1894 after the birth of their second child. Her death deeply affected Venizelos and as sign of mourning he grew his characteristic beard and mustache, which he retained for the rest of his life. After his defeat in the November elections of 1920 he left for Nice and Paris in self-imposed exile. In September 1921, twenty-seven years after the death of his first wife Maria, he married Helena Schilizzi (sometimes referred to as Elena Skylitsi or Stephanovich) in London. Advised by police to be wary of assassination attempts, they held the religious ceremony in private at Witanhurst, the mansion of family friend and socialite, Lady Domini Crosfield. The Crosfields were well connected and Venizelos met Arthur Balfour, David Lloyd George and the arms dealer Basil Zaharoff in subsequent visits to the house. The married couple settled down in Paris in a flat at 22 rue Beaujon. [clarification needed] He lived there until 1927 when he returned to Chania. Venizelos father's shop in Chania. Building 22 rue Beaujon in Paris where Venizelos died. A statue in Thessaloniki (sculpt. Giannis Pappas). ^ i: The most pronounced violation was when the Allies occupied the island of Corfu and used it as a base to gather the remains of the Serbian army. The Allies informed Athens of their intention a few hours before the first ships reaching the island. ^ a b c "Venizélos, Eleuthérios". Encyclopædia Britannica Online. 2008. ^ "Intrigue in Greece". The Argus. Melbourne. 4 July 1916. p. 7. Retrieved 29 November 2012 – via National Library of Australia. ^ a b c d Mitsotaki, Zoi (2008). "Venizelos the Cretan. His roots and his family". National Foundation Research. Archived from the original on 2007-05-18. ^ a b c Papadakis, Nikolaos E. (2008). "Eleftherios Venizelos His path between two revolutions 1889–1897". National Foundation Research. Archived from the original on 2007-05-18. ^ a b c d e f g h Manousakis, George (2008). "Eleftherios Venizelos during the years of the High Commissionership of Prince George (1898–1906)". National Foundation Research. Archived from the original on 2007-09-27. ^ Archontaki, Stefania (2008). "1906–1910, The Preparation and Emergence of Venizelos on the Greek Political Stage – Venizelos as Prime Minister". National Foundation Research. Archived from the original on 2007-09-27. ^ a b c Gardika-Katsiadaki, Eleni (2008). "Period 1910 – 1914". National Foundation Research. Archived from the original on 2007-05-18. ^ "World War I – Greek Affairs". Encyclopædia Britannica Online. 2008. ^ a b c d e f Theodorakis, Emanouil; Manousakis George (2008). "First World War 1914–1918". National Foundation Research. Archived from the original on 2007-05-18. ^ "Venizelos shot, twice wounded by Greeks in Paris". New York Times. 13 August 1920. p. 1. ^ a b Theodorakis, Emanouil; Manousakis George (2008). "Period 1920–1922". National Foundation Research. Archived from the original on 2007-05-18. Abbott, G. F. (2008). Greece and the Allies 1914–1922. London: Methuen & co. ltd. ISBN 978-0-554-39462-6. Alastos, D. (1942). Venizelos, Patriot, Statesman, Revolutionary. London: P. Lund, Humphries & co.
Bagger, E. S. (1922). Eminent Europeans; studies in continental reality (PDF). G.P. Putnam's Sons. Burg, D. F. (1998). Almanac of World War I. Lexington: University Press of Kentucky. ISBN 0-8131-2072-1. Chester, S. M. (1921). Life of Venizelos, with a letter from His Excellency M. Venizelos (PDF). London: Constable. Clogg, R. (2002). A Concise History of Greece. London: Cambridge University Press. ISBN 0-521-00479-9. Dalby, Andrew. Eleftherios Venizelos: Greece (Haus Publishing, 2011). Dutton, D. (1998). The Politics of Diplomacy: Britain and France in the Balkans in the First World War. I.B. Tauris. ISBN 978-1-86064-079-7. Fotakis, Z. (2005). Greek naval strategy and policy, 1910–1919. London: Routledge. ISBN 978-0-415-35014-3. Gibbons, H. A. (1920). Venizelos. Houghton Mifflin Company. , A favorable biography by an American expert. Hibben, Paxton (1920). Constantine I and the Greek People. New York: The Century Co. ISBN 978-1-110-76032-9. Hickey, M. (2007). First World War: Volume 4 The Mediterranean Front 1914–1923. Taylor & Francis. ISBN 1-84176-373-X. Holland, R. F.; Makrides D. (2006). The British and the Hellenes: Struggles for mastery in the Eastern Mediterranean 1850–1960. Oxford University Press. ISBN 0-19-924996-2. Kerofilias, C. (1915). Eleftherios Venizelos, his life and work (PDF). John Murray. Kitromilides, P. (2006). Eleftherios Venizelos: The Trials of Statesmanship. Edinburgh: Edinburgh University Press. ISBN 0-7486-2478-3. Koliopoulos, G.; Veremis, T. (2002). Greece : the modern sequel : from 1831 to the present. New York: NYU Press. ISBN 0-8147-4767-1. Legg, K. R. (1969). Politics in modern Greece. Stanford University Press. ISBN 0-8047-0705-7. Leon, G. B. (1974). Greece and the Great Powers 1914–17. Thessaloniki: Institute of Balkan Studies. Pentzopoulos, D.; Smith M. L. (2002). The Balkan exchange of minorities and its impact on Greece. C. Hurst & Co Publishers. ISBN 1-85065-674-6. Price, Crawfurd (1917). Venizelos and the war, a sketch of personalities and politics (PDF). London: Simpkin. Seligman, V. J. (1920). Victory of Venizelos (PDF). Tucker, Spencer C.; Wood, L. M.; Murphy, J. D. (1999). The European Powers in the First World War: An Encyclopedia. Taylor & Francis. ISBN 0-8153-3351-X. Vatikotes, P. (1998). Popular autocracy in Greece, 1936–41: a political biography of general Ioannis Metaxas. London: Routledge. ISBN 978-0-7146-4869-9. Venizelos, E.; Anthony S.; Xanthaky, Sakellarios N. G. (1916). 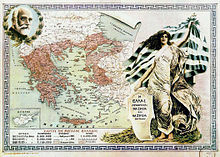 Greece in Her True Light: Her Position in the World-wide War as Expounded by E. Venizelos (PDF). New York. Black, Cyril E. (January 1948). "The Greek Crisis: Its Constitutional Background". The Review of Politics. 10 (1): 84–99. doi:10.1017/S0034670500044521. JSTOR 1404369. Christopoulos, Marianna. "Anti-Venizelist criticism of Venizelos’ policy during the Balkan Wars (1912-13)." Byzantine and Modern Greek Studies 39.2 (2015): 249-265. Dunning, Wm. A. (June 1897). "Record of Political Events". Political Science Quarterly. 12 (3): 352–380. doi:10.2307/2140141. JSTOR 2140141. Dunning, Wm. A. (December 1897). "Record of Political Events". Political Science Quarterly. 12 (4): 734–756. doi:10.2307/2139703. JSTOR 2139703. Gerolymatos, Andre. "Lloyd George and Eleftherios Venizelos, 1912-1917." Journal of the Hellenic Diaspora (1988) Vol. 15 Issue 3/4, pp 37-50. Ion, Theodore P. (April 1910). "The Cretan Question". The American Journal of International Law. American Society of International Law. 4 (2): 276–284. doi:10.2307/2186614. JSTOR 2186614. Kyriakidou, Maria (2002). "Legislation in Inter-war Greece Labour Law and Women Workers: A Case Study of Protective" (PDF). European History Quarterly. 32 (4): 489. doi:10.1177/0269142002032004147. Mazower, M. (December 1992). "The Messiah and the Bourgeoisie: Venizelos and Politics in Greece, 1909–1912". The Historical Journal. 35 (4): 885–904. doi:10.1017/S0018246X00026200. JSTOR 2639443. Papacosma, S. Victor. "The Republicanism of Eleftherios Venizelos: Ideology or Tactics?." Byzantine and Modern Greek Studies 7 (1981): 169-202. Prevelakis, Eleutherios. "Eleutherios Venizelos and the Balkan Wars." Balkan Studies 7.2 (1966): 363-378.